With a growing number of international tourists visiting the continent, governments are spending significant amounts of money to develop air transport infrastructure. Africa’s airports are becoming busier. In 2015, the continent saw 1.186 billion international arrivals – a 4.6% increase over the previous year, according to the 2016 AfDB Tourism Monitor report. In the first seven months of 2017, international arrivals rose by 14% year-on-year and there was a 12.6% increase in intra-African travel, which now makes up 26% of travel across the region, according to ForwardKeys – a London-based firm that predicts travel patterns by analysing more than 17 million daily travel bookings. This double-digit increase in air arrivals is largely attributed to a healthy competitive growth in airline and airport capacity (as airports vie for airline traffic in a bid to become regional hubs) and ongoing airport expansion projects, as well as the relaxation of visa requirements for various countries. And looking ahead, Africa appears set to remain a popular travel destination, be it for leisure or business. As of 31 July 2017, airplane seat bookings were up 16.8% year-on-year. However, despite the uptick of arrivals to the continent, the numbers could be much higher were it not for the infrastructure deficit or the inefficiency of established infrastructure. It’s been widely documented that the continent has an estimated infrastructure deficit of around US$93 billion per annum. While infrastructure plays a vital role in intra-African investments, economic growth, development and tourism, it needs to be upheld by firm legislation and a strong regulatory framework. And despite numerous African nations signing the 1988 Yamoussoukro Declaration to establish a multilateral open-skies agreement, many signatories have not fulfilled the necessary requirements. National carriers guard their protectionist fears over flight routes and there are no mechanisms to settle disputes should conflicts around competition regulations arise. This makes it challenging for aviation companies to map out new routes across the continent without drawing up a bilateral treaty with the destination country. ‘Countries that have been more active in signing bilateral agreements – Ethiopia, Kenya and South Africa – have been able to create strong state-owned carriers,’ states the 2017 World Economic Forum Travel and Tourism Competitiveness report. ‘Twenty of the 30 sub-Saharan countries covered by the report apply ticket taxes and airport charges above the world average. Air transport in particular, and transport infrastructure generally, remain, to date, the biggest challenges for travel and tourism development in Africa.’ And so, three decades after signing the Yamoussoukro Declaration, there is little competition across a poor connectivity network; ticket prices, airport taxes and landing charges remain high; and inefficient visa policies are a reality. However, governments across the continent are addressing the exponential growth of international tourists by increasing airport capacity through large-scale construction projects, while trying to ease security concerns and relax visa regulations. ‘Investing in increasing air transport and airport infrastructure holds material value and will certainly play a vital role in encouraging and supporting growth in travel and tourism development in African countries – not to mention the positive knock-on effect in GDP growth in the respective economies,’ says Vishaal Lutchman, WSP in Africa divisional director of transport and infrastructure. He adds that currently, ‘just 10% of Africans travel by air, which is only expected to grow as more people can afford to pay for the cost of air travel. However, given growth rates being experienced across Africa – as 10 of the world’s fastest-growing economies are in Africa – and the emergence of the middle class, in recent years there has been a steady increase in demand for air transport of passengers and freight. Airports go a long way in getting the tourism’. Three of South Africa’s biggest international airports – Johannesburg, Durban and Cape Town – are among the continent’s busiest. Annually, more than 21 million passengers arrive or depart from Johannesburg’s OR Tambo International Airport alone, according to the airport’s spokesperson, Leigh Gunkel-Keuler. All three airports also feature in the 2017 Skytrax World Airport Awards’ list of the top 37 airports globally. The air transport industry is a vital component of South Africa’s economy. It supported a US$7.4 billion gross value-added contribution to the country’s GDP in 2014, as stated in an Oxford Economics report commissioned by the International Air Transport Association. ‘The study confirms the vital role of air transport in facilitating over US$110 billion in exports, US$140 billion in foreign direct investment and around US$9.2 billion in inbound leisure and business tourism for South Africa,’ says Muhammad Ali Albakri, IATA’s regional vice-president for the Middle East and Africa. To accommodate passenger growth, increase capacity and modernise facilities, Transport Minister Dipuo Peters announced plans for various multibillion-rand upgrades – due for completion by 2023 – to the Cape Town and Johannesburg international airports. The planned upgrades are expected to ‘introduce new or additional capacity to ensure that the Airports Company South Africa (ACSA) network of airports can support the growth in air transport demand in a sustainable manner’. Cape Town International Airport is planning a realigned runway and associated taxiways, a new domestic arrivals terminal, redevelopment of Terminal 2, new boarding gates and an international departures lounge. This comes at a price tag of about ZAR3.28 billion, with overall completion set for 2022. Johannesburg expects to double its hourly passenger processing capacity at Terminal A, with the aim of reducing congestion and queuing time, thanks to a new ZAR2.5 million passenger link. ACSA also plans to roll out ‘smart security’ technology that eliminates the need for human contact in Terminal A, as part of its ZAR448 million refurbishment and redevelopment – even though National Treasury has allocated an extra ZAR17 million for the 2018/19 financial year to increase staff capacity. The priciest construction project, however, will be that of remote apron stands, at a cost of nearly ZAR1.6 billion. East Africa remains a popular hub for air travel, with international travel bookings to the region up 17.3% in 2016. Ethiopia experienced an increase of 9.6%, Tanzania was up 10.6% and Kenya 14.9% last year, according to ForwardKeys. This has prompted the region to expand its airport capacity. On the back of increased interest in the region, two European charter airlines – TUI Airlines of the Netherlands and Travel Service of the Czech Republic – will begin operating weekly direct flights to Mombasa, as of November. 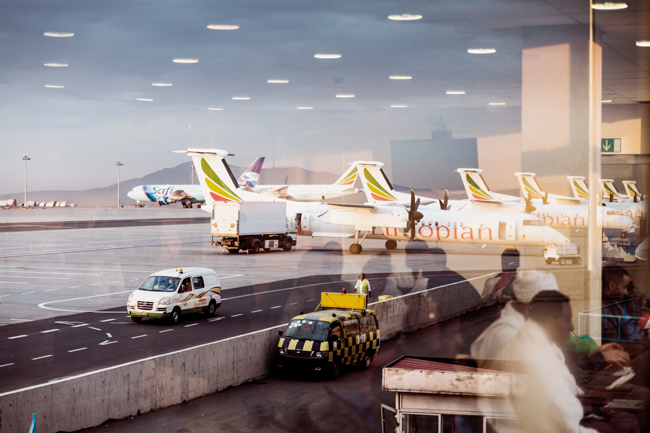 Ethiopia’s Addis Ababa Bole International Airport has been expanding two terminals, and constructing a new VIP terminal, shopping area and car park since January 2015 to accommodate the growing number of travellers making their way through this regional hub. The success of Ethiopian Airlines (the country’s national carrier) and Ethiopia’s fast economic growth has resulted in more than 8.5 million passengers per annum heading through the airport, despite its capacity of 6 million. According to Wondim Teklu, communications director at Ethiopian Airports Enterprise, passenger traffic is growing at a rate of 22%. When the US$345 million expansion project (funded by a loan from Exim Bank of China and which has been contracted to Chinese construction firm, CCCC) is complete, in January 2018, the airport is expected to have an annual capacity of approximately 22 million passengers. In line with Rwanda’s Vision 2020, the Bugesera International Airport, (25 km outside the capital city) is undergoing renovations. At a cost of US$818 million, the four-phase project will increase its current capacity by seven times to eventually cater for 4.5 million annual passengers when complete. The first phase is expected to be ready by end-2018. Meanwhile, Rwanda’s national carrier, RwandAir, is investing in new aircraft as the country is seeing a rise in tourism and is being punted as a business travel destination (for instance, Kigali recently hosted the Africa Hotel Investment Forum and air service development event AviaDev). ‘As an international executive who has travelled around Africa for many years, I’m longing for the day when it is easier to fly directly between African cities, as is possible on other continents,’ says Jon Howell, MD of AviaDev. In West Africa, US-based United Airlines and Spanish airline Iberia have withdrawn their operations to Nigeria, while Emirates and other international carriers have decreased their flight services to the country. Howell attributes this to the fact that ‘many airlines could not repatriate funds after the currency crisis in 2016’. Private Nigerian airline Arik Air announced a cut of 53% of seats on its domestic and international flights to and from Lagos for the remainder of the year, due to budget constraints. The demand has been filled by Ethiopian Airlines, which is currently the largest airline operating in the country and serves five Nigerian destinations from its regional hub in Lomé, Togo. In September, the Nigerian government approved an operating concession for the Murtala Muhammed International Airport in Lagos and Nnamdi Azikiwe International Airport in Abuja, to private operators. Nnamdi Azikiwe International Airport underwent runway renovations in March, while Murtala Muhammed International Airport is undergoing a multibillion-naira renovation with a new terminal, five-storey office complex and car park facility after a loan from Exim Bank of China. However, it is North Africa that has shown the highest growth in inbound travellers in 2017, as the region bounces back from dwindling tourist numbers following security concerns in recent years, and the relaxation of visa regulations. Inbound travel to Tunisia is up 33.5% and 24.8% in Egypt, both on the back of lifted visa restrictions on Chinese travellers. The greatest increase of Chinese arrivals have been recorded in Morocco (450%) and Tunisia (250%). The World Bank is financing a substantial US$387 million refurbishment of Cairo International Airport’s Terminal 2 that is being undertaken by Turkey-based Limak Holding that will see it increase capacity to 8.5 million annual passengers. The airport boasts a third parallel runway and a new seasonal terminal, while a metro line that will connect the airport to Gaza is expected to be in operation in 2019. 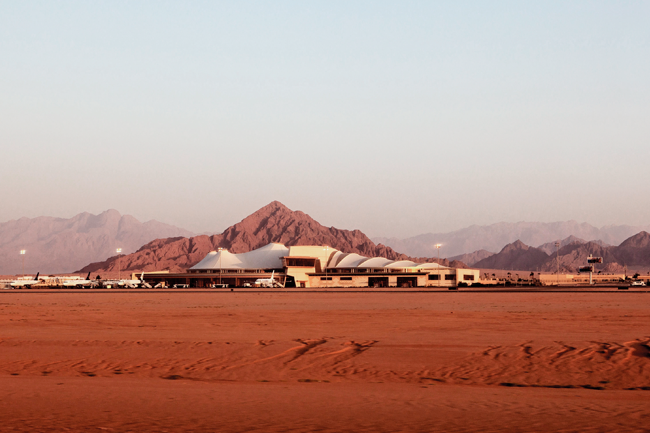 Also in Egypt, Sharm El-Sheikh International Airport is being given a facelift. Joint funding from the World Bank and Islamic Development Bank will be put towards the construction of Terminal 3, which is expected to nearly double passenger capacity from 10 million to 18 million.